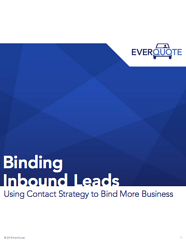 Want to boost your lead revenue by up to 128%? Working leads the right way can have a big impact on the success of your agency. Master the art and science of closing a deal with four simple steps. Download this white paper to find out what they are—and how to implement them—so you can bind more policies and win more business.